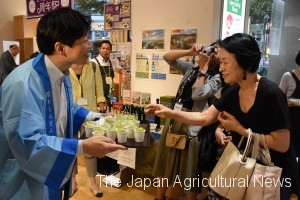 Okayama Goveror Ryuta Ibarakgi offered locally grown grapes to consumers at a Tokyo outlet. TOKYO, Sept. 8 ― Ryuta Ibaragi, governor of Okayama Prefecture, which was hit hard by the torrential rains in July, has campaigned to promote his local grapes, Shine Muscat and Pione, which command huge price premiums. Ibaragi showed up at a Tokyo outlet to offer tasting local grapes to consumers at a Tokyo outlet on Sept. 7.